A trip to Hawaii always sounds appealing, but flights to the U.S.'s tropical paradise are often expensive, even during a sale. Fortunately, United is able to get you there for the price of a continental flight. Yes, you're in for sun, swimming, volcanos that hopefully aren't erupting, and a long flight to the middle of the ocean. 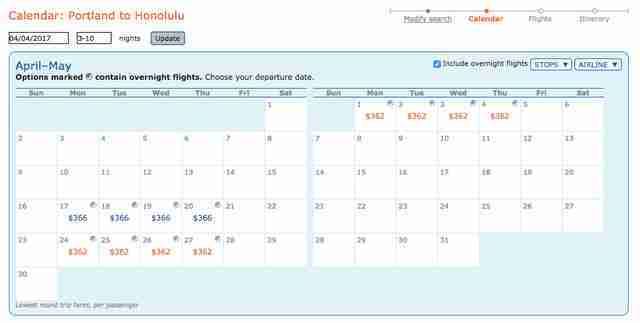 The deal can be found on flights in late April and into early May flying out of Portland and headed to either Honolulu or Maui. As The Flight Deal highlights, you can take advantage of the deal by using the ITA Matrix Airfare Search. Enter "PDX" as your departure airport and "HNL" as the destination for Honolulu or "OGG" as the destination for Maui. Then enter "ua+ /f bc=G" as the advanced routing code in both the "outbound" and "return" fields. Below, click "see calendar of lowest fares" and enter "3-10" as the stay length. You'll find a handful of dates that have roundtrip flights for just $362 and others for $366. But if you want to take advantage of the deal, move quickly because tickets will disappear. Earlier Monday tickets were as low as $332 and appear to be slowly climbing as seats are filled.